A migrant rests in a bus trunk waiting to leave toward Croatia from the village of Adasevci, Serbia, Wednesday, Feb. 24, 2016. Human trafficking is back in a big way in the Serbian capital and elsewhere along the Balkan migrant corridor _ a veritable growth industry for locals as European Union nations slam their borders shut in a domino effect, leaving thousands of refugees stuck at Greece’s northern border. BELGRADE, Serbia (AP) — Tensions simmered one night inside the smoky Belgrade City cafe in a rough neighborhood near the train station. The price of a human being was being decided. Dozens of young Middle Eastern and African men dressed in track suits and woolen caps were frantically negotiating with a Serbian smuggler on the costs of illegal trips over Balkan borders that are rapidly closing to them. The migrants, desperate to escape war and poverty in their homelands, needed help to get closer to their dream destination — Western Europe. "I cannot do it for less than 5,000 (euros) for that group," the smuggler told a Moroccan middleman in English, who relayed the sum in Arabic on his cellphone to others. There was a short pause. "That's too much for those people, they don't have that money," the Moroccan said. "Then, no deal," the Serb smuggler replied. Taking a deep cigarette puff and a sip of whiskey, he turned to other potential clients who were lined up along the dim-lit bar covered with fading photos of Paris and other European capitals. Human trafficking is back in a big way in the Serbian capital and elsewhere along the Balkan migrant corridor — a veritable growth industry for locals as European Union nations slam their borders shut in a domino effect, leaving thousands of refugees stuck at Greece's northern border. Refugee entry restrictions and tighter transit rules imposed recently by Austria and several Balkan states have stalled but not stopped the flow of refugees across Europe — fueling a boom time for the region's ruthless smuggling gangs. Refugees are being packed into car trunks or squeezed into secret compartments on trucks or buses, then driven along the same illegal smuggling routes used by drug traffickers. Other migrants may be taken through regular border crossings where guards or custom officers are being bribed to turn a blind eye. Still others are driven to the borders by small-time freelance traffickers, mostly taxi drivers, and left to cross the fences on their own in the pitch dark. If the migrants are lucky, they will be picked up again by another smuggler on the other side of the border after walking through forests or across frozen rivers. If not, they will be caught by border patrols. Either way, their cash is gone, straight into the pockets of smugglers. Rados Djurovic, of the Belgrade-based Asylum Protection Center, said once migrants enter Greece from Turkey, "there is no turning back." "It's an illusion to think that by harassing or restricting their human rights, the migrants will give up and return to their countries," Djurovic said. He said with the new border restrictions, Balkan traffickers — who had been virtually out of work when the flow of migrants was mostly unhindered last summer — are back on the streets of Belgrade. "We are now again seeing some old faces, including some of the migrants who are part of the organized smuggling rings," Djurovic said. Prices have risen to 1,000 euros ($1,090) per migrant for a 600-kilometer (375-mile) trip from the Greek border with Macedonia to the Serbian capital, he said. It will cost another 1,000 to 3,000 euros ($1,090 to $3,260) for the 600 more kilometers further to Vienna, the Austrian capital. Payment is always in cash. And increasing demand means those prices may rise again shortly. Sometimes the migrants are risking not only their money, but their lives. 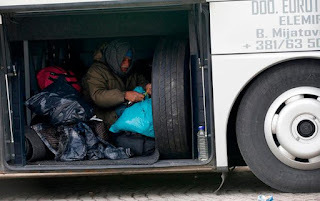 Last August, Austrian authorities found 71 migrants, from 10 months to 56 years old, who suffocated in the air-tight cargo of a truck that left Serbia, traveling via Hungary to Austria. Europol, the EU law enforcement agency, estimated that 90 percent of the 1.1 million refugees who reached Europe last year used smugglers during some part of their journey. Up to now, smugglers had mostly thrived in Turkey, arranging dangerous boat trips for migrants across the Aegean Sea to Greece. Now smuggling opportunities have bloomed across the Balkan migrant route that goes through Macedonia, Serbia, Croatia and Slovenia before reaching Austria. "The people-smuggling trade is at the heart of the migrant crisis," said Rob Wainwright, the director of Europol. "We have to tackle the evil people behind this." When Hungary built a razor-wire fence on its borders with Serbia and Croatia last summer, the flow of migrants was redirected westward toward Slovenia. Tight border patrols and tough new Hungarian laws punishing illegal entry and border fence vandalism slowed the flow to a trickle. But now illegal crossings into Hungary have sharply increased after other nations along the Balkans last week reduced the flow of people to only a few hundred a day and set new limits on their nationalities. Afghans, who had passed freely before, were suddenly not being allowed to leave Greece, and no officials would say why. By Tuesday, Greek police estimated that up to 10,000 refugees, including many families, were stuck at its northern border, overflowing the refugee camp at Idomeni. Refugees "are now forced to choose between spending what little money they have left on food or on smugglers," said Goran Bilic of the Save the Children charity. Ahmet Ismaily, a Moroccan now stuck in Belgrade, says there's few migrants left who can afford to pay the Belgrade City smuggler's prices. "The rich people have made it to Europe in the first wave (of migrants)," said Ismaily, who finished a dental degree but could not find work at home. "Only poor desperados like me are left behind." Still, Ismaily has a plan. He is going to pay 200 euros ($217) to a Serbian taxi driver who will take him to Hungary's razor-wire border fence. He will try to climb it, evading the constant border patrols, then spend another 220 euros ($239) for a Hungarian cabbie to take him to Vienna. Along the way he will shave and get some new clothes "to look more European." "Even getting caught is better than going back home. I will return only in a coffin," he said. AP reporter Jovana Gec contributed.